United States Navy SEALs are a special operations organization of the United States Navy, reporting to the Naval Special Warfare Command, part of the United States Special Operations Command. The name is an acronym for "sea, air, land"; they are also parachute-qualified successors of the Underwater Demolition Teams, or "frogmen", of the Second World War. SEALs specialize in direct action (DA) and special reconnaissance (SR) in which the mission involves operating in water, although they also operate with other special operations forces where needed, as in the Afghanistan War (2001-). While DA and SR are their core capabilities, they also receive missions in counterterrorism, foreign internal defense and security assistance, information operations, counter-drug operations, personnel recovery including combat search and rescue, hydrographic survey and unconventional warfare (UW). UW, however, remains the primary responsibility of United States Army Special Forces; only one of the SEAL teams is required to have foreign language proficiency generally needed in guerrilla warfare. Basic SEAL operations are based on 16-man platoons, which often divide into 8-man elements; the 8-man structure derives from the capacity of one of their early small boats. Eight platoons and a headquarters form a standard SEAL Team, headed by a commander, U.S. Navy. They were extremely effective in the Vietnam War, often operating from rivers and striking targets near water, or making helicopter-borne or underwater beach infiltrations. SEAL personnel were active in MACV-SOG. The relatively small unit received three Medals of Honor. SEALs are not naval infantry and rarely are used in multiple-platoon operations; one attempt to do so, at Padilla Airport during Operation Just Cause, was disastrous as classic SEAL tactics were not used. In contrast, a single platoon assigned to disable Panamanian boats on which Manuel Noriega might escape was completely successful. The Teams are commanded by Naval Special Warfare Groups, which also provide SEAL Delivery Vehicle Teams (SDV) and Special Boat Teams. SDVs are manned underwater vehicles that are carried to the area of operations by submarines. The Command has over 8,000 active duty personnel, including SEALs and the Special Warfare Combatant Craft teams. DEVGRU, formerly known as, SEAL Team 6, is part of the especially secret Joint Special Operations Command, and is involved in especially clandestine operations. On April 12, Easter Sunday, they wasted some pirates and rescued a ship's captain. Go, Seals! SEALs undergo what is considered among the world's most difficult special operations selection programs. This program is split up into a series of schools and phases each serving a different purpose. These are the minimums and only required to be considered for entry into SEAL Training. Those selected for SEAL Training are then sent to Navy SEAL Preparatory School, located in Great Lakes, IL, where they spend 2 months preparing for BUD/S. Those that survive the Preparatory School are sent to Basic Underwater Demolitions School. This is widely regarded as the most difficult training school that the military has to offer (dropout rate has been estimated around 80%). BUD/S is split into 3 Phases; each phase has a different purpose. Phase I is the best known phase of the three. The purpose of Phase I is to condition the candidates. This phase is a grueling seven weeks long and is highlighted by a week known as "Hell Week." Hell Week begins on Sunday with an event known as "breakout night." Starting early on Sunday the candidates are required to all be located in a room together on the Special Warfare Compound, throughout the day the candidates try to eat, sleep, and stay in the moment. At some unspecified time that night the doors are broken open, lights turned out, and the candidates are herded with blank machine gun fire, explosive charges, shouting, etc... It can be described as all out madness and hysteria. This is truly the beginning of a week that each candidate will look back on for the rest of their lives. During Hell Week, candidates will receive only about three or four hours of sleep and will run 200 or more miles. Unfortunately, for the candidates, everything the candidates do during Hell Week is done carrying Rubber Raiding Craft (Rubber Boats that platoons carry above their heads). The candidates complete more than 20 hours of physical training per day! Phase II is known as the combat diving phase and is also about seven weeks in length. This phase is when SEAL Candidates learn water competency, open and closed circuit diving, and is highlighted by pool week. Phase III is the phase where students learn land warfare skills and is also about seven weeks long. This phase is when candidates learn basic weapons skills, demolitions, marksmanship, and small unit tactics. This phase culminates in a practical application of the skills they have learned and takes place on San Clemente Island. This phase usually has the lowest dropout rate. Candidates who survive BUD/S are sent to SEAL Qualification Training. This is where SEAL Candidates learn intermediate/advanced skills including weapons training, small unit tactics, demolitions, cold weather training, medical skills, SERE, and parachute training. Those who graduate from SQT receive the ultimate of all U.S. Military Insignia--The Trident. The insignia, formally named the Trident but commonly called the "Budweiser" due to its similarity to an American beer's advertising symbol, is a mark of basic qualification; new SEALs are not considered fully qualified until after a substantial amount of experience with a deployed Team. There are "sea stories" that the original badge design was intended to be outrageous to the Navy hierarchy, but, to the surprise of the designers was accepted, and is worn with pride. All SEAL units are under the Naval Special Warfare Command headquartered in Coronado, California. 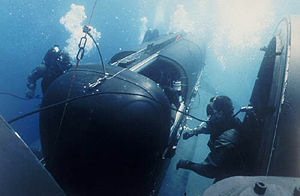 Most SEAL teams are then under Naval Special Warfare Group 1 on the West Coast (Coronado, California) or Naval Special Warfare Group 2 on the East Coast (Little Creek, Virginia); the Teams are then given geographic specialization and detailed as part of the Special Operations component of Unified Combatant Commands. There are also two SDVTs (SEAL Delivery Vehicle Teams). SDVT-1 is located in Pearl Harbor, HI and SDVT-2 is located in Little Creek, Va.
SEAL Team 6 was originally created by Richard Marchinko for the purpose of Counter-Terrorism, and Quick-Reaction Missions. Not much is known about SEAL Team 6 other than what was divulged after the Team's disbanding, and eventual replacement by DEVGRU, in Richard Marchinko's books. Mr. Marchinko was the first Commanding Officer of SEAL Team 6 and held that command for an unusually long time (3 years). Development Group or DEVGRU, formerly SEAL Team 6, is not assigned to a geographic command, but to the Joint Special Operations Command of the United States Special Operations Command. They have some similarities to Delta Force, although greater water skills but probably less language, all-round land warfare and undercover capabilities. SEALs trace their ancestry both to Navy and Office of Strategic Services units. The first Naval organization was the Scouts and Raiders, created in August 1942 and led by Phil H. Bucklew. In 1943, they became the Underwater Demolition Teams (UDT) under Draper Kaufmann, which surveyed landing beaches and destroyed obstacles before amphibious landings. Also in their lineage are the Operational Swimmer units of the OSS. Until 1983, the Navy had both UDT and SEAL teams. UDT personnel worked in the water and on the beach, but not beyond the waterline. SEALs, however, conducted extensive DA and SR in the Vietnam War. This page was last modified 21:34, 12 August 2010.